Should you find yourself in Layton and hankering for a cheap, friendly, delicious meal, set your GPS for Hawaii—or, rather, Big Sai’s Hawaiian BBQ. It’s a small mom & pop joint with a walk-up-and-order counter that always seems to be busy at lunchtime and for early dinners when the folks at nearby Hill Air Force Base get off work. One wall of Big Sai’s is an homage to Hawaiian football players, with signed and autographed jerseys and photos from the likes of Troy Polamalu, Lofa Tatupu, Junior Ioane and many more. On the opposite wall is a simple painting of the Hawaiian Islands, with only the town of Laie on Oahu highlighted—where the family that operates Big Sai’s comes from. As for Big Sai? Well, he ain’t so big. He’s actually the 12-year-old son of the owners. Big Sai’s is a small place with big flavors, not to mention big portions for little prices. 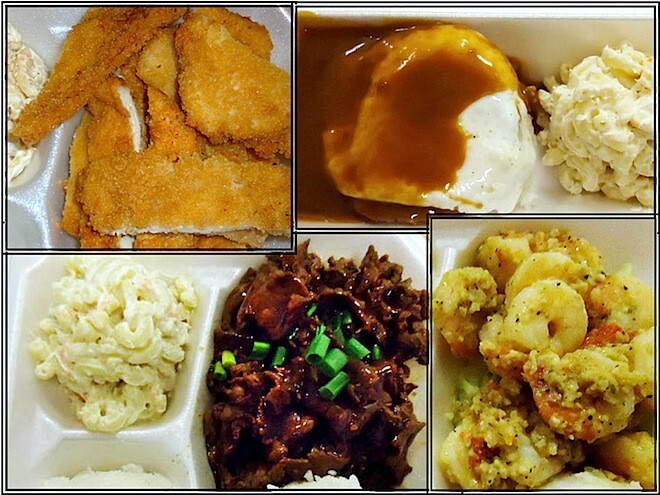 Menu items include teriyaki beef and chicken, Kalua pork, fried spam & eggs, Laie chicken wings and Japanese-style chicken katsu. Most of the menu items come in a “mini” size ($5.65-$7.65) or “regular” ($6.95-$8.95) and include a side of rice and macaroni salad. There is nothing mini about the mini portions, however. The mixed mini plate ($7.65) consists of one grilled short rib; four or five boneless, grilled chicken thigh pieces; and about a quarter-pound of beef, along with a mound of white rice and a hefty portion of macaroni salad, all topped with a slightly sweet teriyaki sauce, mildly spiked with garlic. Both the chicken and beef were very tender and tasty. And, I’ve gotta tell you, the macaroni salad here is bodacious. I took an order home and was so impressed that I called back to find out how the macaroni salad was made. Turns out it’s nothing more than al dente macaroni, a little mayonnaise, shredded carrot and black pepper. That’s it. Another great choice is the Loco Moco ($5.65), which is two grilled beef patties topped with two fried eggs and smothered in brown gravy. I could feel my arteries hardening as I ate it and loved every bite, but I still couldn’t resist ordering the guava cake ($3.25). Add super-nice service and you’ll want to veer off the beaten path to Layton, and Big Sai’s.